Ok, I know this is not a cruise picture (those will come), but we had a great time and the cruise was SO relaxing! We do not have Internet right now so I will catch up in the Internet world, but I had to post this picture. We took Andrew and Grace (my sister's daughter) to a walk-through of lights and to see Santa. 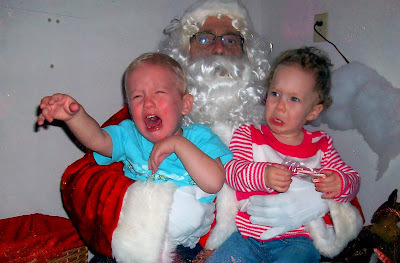 If you ask me this picture is hilarious and a classic 'photo with Santa'. If I do not get on the blog again before Christmas, I hope you all have a very Merry Christmas and a Happy New Year!